Pontefract Civic Society Blue Plaque Guide at Pontefract01977 708658work Town TrailPontefract Blue Plaque Guide has been produced by Pontefract Civic Society and is available from the Library and the Museum. Well over 20 plaques located across the town centre and castle conservation areas can be viewed at your leisure, and in any sequence of your choice. A short history of Pontefract's strategic importance through the ages is included in the guide. Pontefract has a rich historic past and a bright future, and Pontefract Civic Society wishes to contribute to this future by taking a concerned interest in the town’s environmental, development and regeneration. With a history of over 40 years, the Society has been instrumental in the quality of public realm in the precinct (where stone setts have been used), also in supporting new Conservation Areas, and by presenting public talks, Design Awards and a Facade of the Year. Society committees focus into four areas for campaigns, lobbying and projects which are: 1. Conservation, Environment & Planning; 2. Land Use & Transport; 3. Publicity & Events; and 4. Parks & Open Spaces. 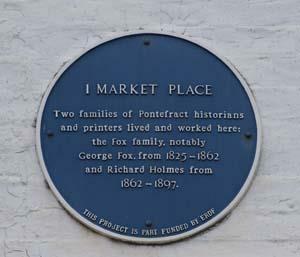 Pontefract Blue Plaque Guide has been produced by Pontefract Civic Society and is available from the Library and the Museum. Well over 20 plaques located across the town centre and castle conservation areas can be viewed at your leisure, and in any sequence of your choice. A short history of Pontefract's strategic importance through the ages is included in the guide.